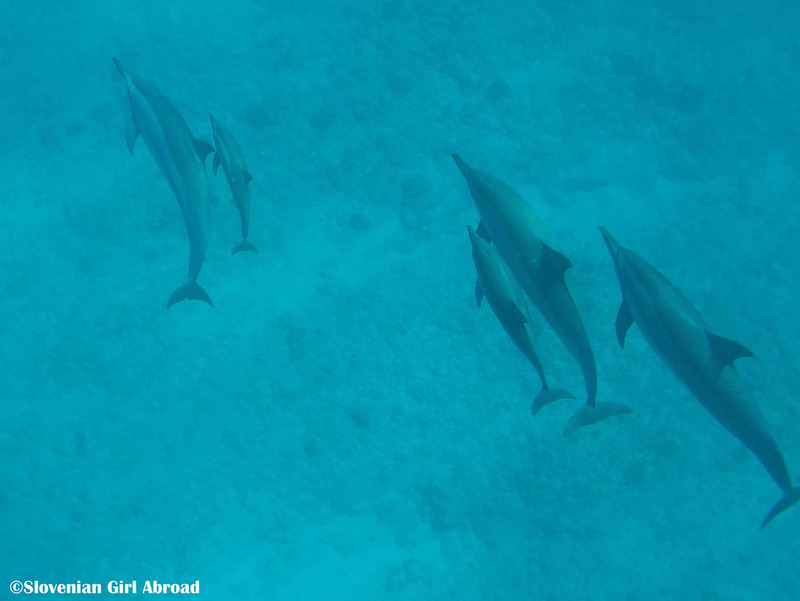 There are plenty of tours that would take you to see the dolphins. We opted out for a private tour on a speedboat run by a couple of locals – mainly because the price for our group of four people was just slightly higher than the price for a regular tour by the same operator. It was great decision as we had the luxury of tailoring our own itinerary. 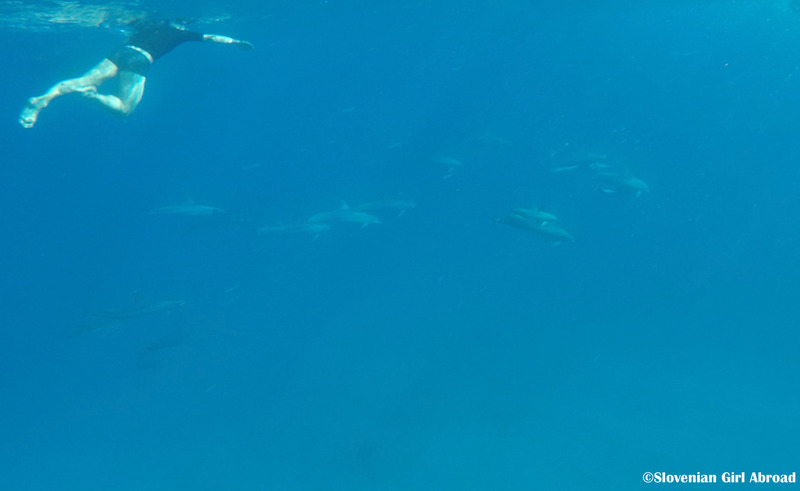 Also, smaller groups are supposed to be less disturbing for the dolphins. Our trip began early in the morning. We drove to Riviere Noire and meet our guides in the port. We’ve boarded little speedboat and drove to the Tamarin Bay. As soon as we entered the area where dolphins come to feed, the driver lowered the speed of the boat and we all looked for the signs of the dolphins. Soon we spotted the first one and then the second one and then the third one. Quickly as I can, I took my shirt and shorts off, grabed my snorkell and flippers and jumped into the water. I wasn’t sure what to expect, but what I saw under the water exceeded all my expectations. The words can’t describe the feeling when I finally saw those amazing animals, freely swimming in the crystal clear water of the Indian ocean. Seeing them in the place where they belong to was amazing, more than amazing, spectacular, superb. 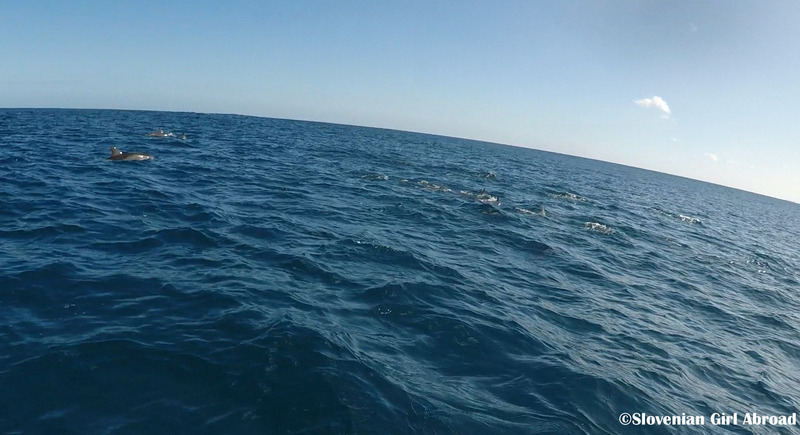 Dolphins soon swam away from us. We climbed up to the boat and we slowly drove around the bay until we found another pod. Another jump in the water, another amazing sight of dolphin family. This time, we also saw the baby dolphins. After unforgettable swim with the dolphins, our trip wasn’t over yet. Our guides took us to the snorkelling spots just off La Morne beach where we saw plenty of colurful fishes. But more about this part of the trip in one of the upcoming posts and videos. If after reading about my experience you, I tempted you to book that ticket to Mauritius and a tour to see dolphins, you also need to read this. 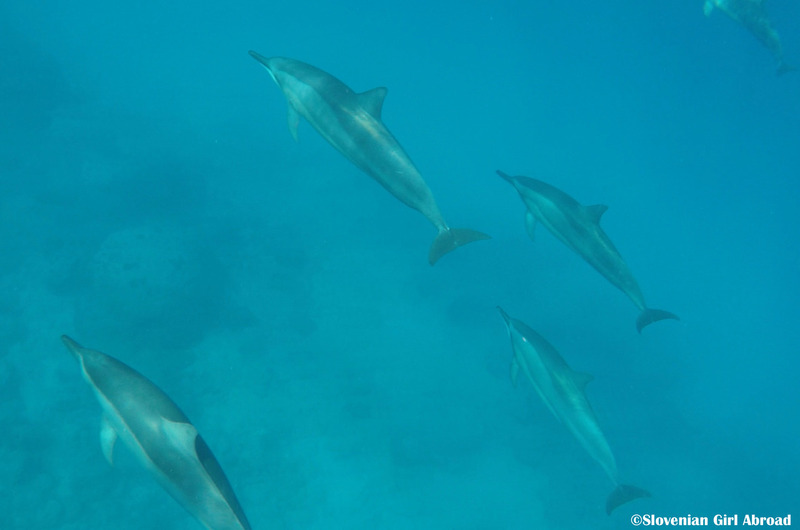 When going to swim with the wild dolphins, please be aware you’re the visitor in their home. Observe them in a respectful way. I urge you to choose your tour provider wisely. Not all of them have the welfare of the dolphins in their first plan. Do your research and make sure they are reputable, responsible and knowledgeable about sustainable practices. We were generally happy to see the attitude of our guides towards the dolphins. They were very careful when navigating the boat around the bay, making sure to approach the dolphins in a way that won’t neither hurt, nor disturbed them. However, one of the guides tried to catch the dolphin by his tail. I’m quite sure that’s is not the right way to interact with the wild dolphins. But everything else was ok, so I guess I can overlook this tiny episode. To sum up, I really enjoyed our trip to see the dolphins. It was definitely one of the experiences I will never forget. What a wonderful experience and great tips on how to interact (not interact) with these beautiful creatures. Indeed it was. Seeing them swimming freely in the ocean was truly majestic. How was your experience? Did you enjoy it? This seems like a great excursion I would have no fear of doing, in terms of being eco-friendly and friendly to the animals! I just went on a dolphin excursion I had no choice of researching beforehand but felt rather guilty the way our boat and especially another entrapped the dolphins between the boats. I will make damn sure next time I have a say as to it being a registered eco-friendly excursion! Thanks for linking up with #TheWeeklyPostcard! I can imagine. 😦 It is always tricky when it comes to the animal interactions. You really need to do your research in order to choose the right tour. Where did you go to see the dolphins? What an amazing experience! So neat you also got to see some baby dolphins, they are so cute. Thanks for sharing on #TheWeeklyPostcard. Aw, how awesome. That must have been amazing. Looks like you had quite an adventure! Nice post! It is really great if you love the underwater world! I’ve mostly been diving in the cold lakes here in Poland, but it’s still very enjoyable 🙂 Hopefully I will make it to Mauritius in the next year or two. 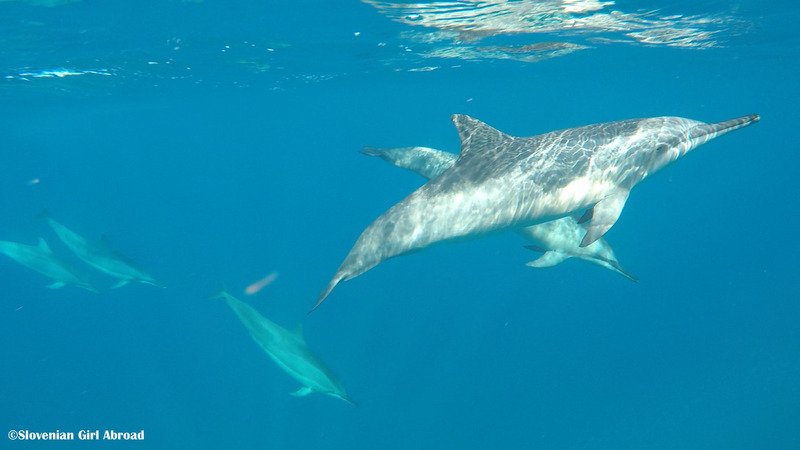 Bottlenose or Spinner Dolphins, but I’m not sure which we saw as they all look alike to me. Thanks for hosting and thanks for your lovely comment! Oh what an experience- I get it was magical. We’ve spotted dolphins off our local coast but I’ve never been lucky enough to swim with them. Thanks for joining #adventurecalling we’ll be back open in the morning for more new posts.